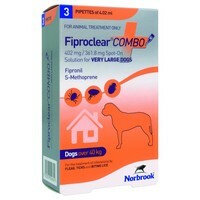 FiproClear Combo Spot-On Solution for Large Dogs is for the treatment of infestations by fleas, ticks and biting lice small breed dogs weighing over 40kg. FiproClear Combo has insecticidal efficacy against new infestations by adult fleas for up to 8 weeks and has a persistent acaricidal efficacy against ticks for up to 4 weeks. Each 4.02ml pipette contains 402mg Fipronil and 361.8mg S-methoprene as the active ingredients.